The first trophy of the 2018/19 football season will be won later this month as Manchester City take on Chelsea in the Carabao Cup Final. You could be at Wembley too thanks to Vegas Luck Casino which is awarding 2 lucky winners and their guests with a VIP package to the big game. If you’re a football fan, the prize is a cracker. As well as top tickets to the final on the 24th of February (2019) you’ll also get to enjoy a 4-course, a la carte pre-match meal complete with free drinks. To be in with a chance of winning 1 of the 2 VIP Cup Final Experience package, first opt in then get spinning on the slots at Vegas Luck. Every £10 wagered will earn you a diamond with each diamond getting you a ticket into that week’s prize draw. You can earn tickets into the Week 1 Prize Draw between now and Sunday the 10th of February (2019) with the draw itself following on Monday the 11th of February. Qualification for the Week 2 Prize Draw follows from the 11th of February until Sunday the 17th of February – the second draw takes place a day later. Even if you miss out on the Cup Final packages, there are plenty of other goodies on offer too. Check out the full list of prizes below. There are no wagering requirements on any of the prizes here. That includes the cash awards and the free spins. Those free spins are worth 10p apiece which you’ll have 3 days to use up. 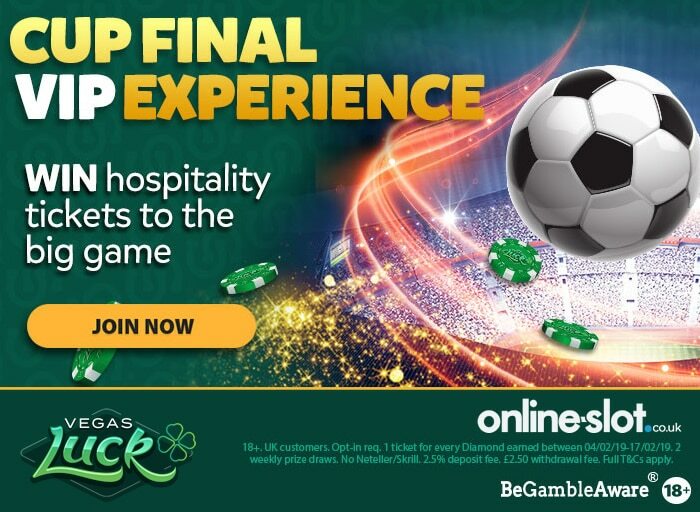 If you’re a Manchester City or Chelsea fan or you just fancy enjoying the Cup Final Experience VIP style, then head on over to Vegas Luck and it could get you on the road to Wembley. New players can join the action at Vegas Luck Casino with a welcome package that awards up to 50 free spins with no wagering requirements or maximum win restrictions. Every £1 you deposit earns you a free spin. Deposit £50 and you’ll get the maximum 50 free spins. T&Cs apply. For full details visit Vegas Luck Casino.